Listed below are the neighborhoods that are currently connected to, under construction or have qualified for Fiber to the Home. This service is available for residents to purchase in these neighborhoods. To sign up for service and see updated neighborhood lists, go to www.cspire.com/ridgeland/. To learn if your neighborhood is close to qualifying or to learn the anticipated installation completion date for your neighborhood, contact Bryan Johnson at 601-856-3877. Why is the City of Ridgeland involved? Fiber to the Home is viewed by City of Ridgeland officials as an incredible opportunity for economic development. 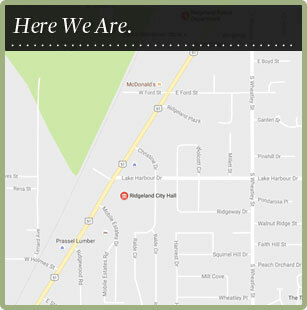 The City of Ridgeland is a place where residents and businesses can benefit from the latest developments in technology. Leaders anticipate the influx of more high technology businesses to Ridgeland as well the ability to attract more retail and professional service businesses because of this technology. They expect the city’s tax base to grow which will result in improved city services, better roads, expanded parks and trail systems, and more police and fire protection. Fiber to the Home will enhance residents’ quality of life and improve home values, helping to maintain the City of Ridgeland as a top choice in places to live and work in the South. Fiber to the Home is a breakthrough technology that can dramatically change the way you connect and bring technology into your home. Speed this fast opens immense opportunities for the individual user to discover new opportunities. In Ridgeland, we have been hearing from Fiber to the Home customers about how it is changing lives. Working from home is possible for professionals who download large files and need access to immense amounts of data. No delays in transferring files and utilizing graphic intensive software programs. Operate your business faster while remaining in a home setting. Greatly enhances the marketability of homes for sale. Remote access to the classroom. Videos and graphic intensive materials can be viewed while other family members use the service. The speed of transmission allows for multiple devices to be in use with no buffering or interruption in service. Improve home values and resell potential. There are endless opportunities by gaining access to this technology. Some neighborhoods still need to become qualified to receive fiber infrastructure by meeting pre-registration requirements.In order to pre-register, residents may go to www.cspire.com/home-services/ and follow the instructions including the $10 refundable deposit. Once a critical mass of citizens pre-register, C Spire will begin the installation process for that area. Ridgeland officials encourage those individuals who want this service to not only sign up, but also talk to their neighbors about signing up in order to reach the area’s pre-registration requirements. If you have questions about the Fiber to the Home project, please contact Bryan Johnson in Community Development at 601-856-3877 for more information. Click here for link to Frequently Asked Questions. * The City of Ridgeland does not expressly endorse C Spire or offer any guaranty of its products or services. The City of Ridgeland advises you to consider all options available for getting Fiber Optic lines to your home.